Earth is intimately tied to the star around which it revolves, the Sun, and the satellite that revolves around Earth itself, the Moon. Without the Sun, of course, life on Earth simply could not exist, not just because of the need for light but to an even greater degree because of the energy it supplies. For that matter, Earth itself would not exist: our planet appears to have developed from the same cosmic cloud that formed the Sun, and without the Sun to hold it in place with its gravitational pull, Earth would go spinning off into space. For all its influence on human life, however, the Sun has less impact on the tides than the Moon, which is smaller but much closer. Together, these two bodies literally define time in human experience, which has been marked by the movements of the Sun and Moon from a time before civilization began. The center of the cloud, where the greatest amount of gases gathered, was naturally the densest and most massive portion as well as the hottest. There, hydrogen—the lightest of all elements—experienced extraordinary amounts of compression, owing to the density of the clouded gases around it, and underwent nuclear fusion, or the bonding of atomic nuclei. This hot center became the Sun about five billion years ago, but there remained a vast nebula of gas surrounding it. As the fringes of this nebula began to cool, the gases condensed, forming solids around which particles began to accumulate. These were the future planets. THE PLANETS AND THE ELEMENTS. Closest to the Sun, the planets and other satellites were formed of elements that could condense at high temperatures: iron, silicon, aluminum, calcium, and magnesium. These elements, along with oxygen-containing compounds, constituted the material foundation around which other particles accumulated to form the terrestrial planets: Mercury, Venus, Earth, and Mars. Further from the Sun, where temperatures were lower, gaseous compounds—including methane, ammonia, and even water—could condense. These compounds became the basis around which the five outer planets (the four Jovian planets and Pluto) formed. The process of planetary formation involved additional steps and took place over a period of about 500 million years. Some of the factors that played a part in forming Earth are discussed in Planetary Science, but in the present context, let us consider the source of those elements mentioned here. Did they just magically form? Were they always there? In answer to the first question, there is nothing magical about the formation of "new" elements, though it almost seems so. As for the second question, the answer is yes and no. The elements themselves were not always there in the universe or on Earth itself; however, the subatomic building blocks that make them up have indeed existed from the beginning of the universe. The basic atomic structure is as follows. There is a nucleus in which one or more protons (positively charged subatomic particles) may reside along with one or more neutrons, which have no charge. Spinning around the nucleus are one or more electrons, or negatively charged subatomic particles. The number of protons and electrons in an atom is always the same, meaning that the atom has no electric charge. Atoms that have lost or gained electrons (in which case they would acquire a positive or negative charge, respectively) are called ions. Electrons, which move fast and possess very small mass compared with protons and neutrons, are very easy to dislodge from an atom; on the other hand, it takes an extraordinary event to change the number of protons in the nucleus. This fact is significant, because it points toward the defining characteristic of an element: the number of protons in the nucleus. Atoms of a particular element always have the same number of protons, called their atomic number. The atomic number of an element can be determined by consulting the periodic table of elements: for instance, iron, with an atomic number of 26, must have 26 protons in its nucleus. If an atom has 25, it is manganese, and if it is has 27, it is cobalt. The number of neutrons in the nucleus may vary for atoms within a given element. Atoms that have the same number of protons (and are thus of the same element) but differ in their number of neutrons are called isotopes. Most isotopes are stable, meaning that their chemical composition will remain as it is; however, some isotopes are radioactive, meaning that they experience the spontaneous emission of particles or energy over a given period of time. Radioactive decay is one of two ways that one element can become another. When a radioactive isotope emits an alpha particle, for example, its nucleus expels a positively charged nucleus consisting of two protons and two neutrons, which is the same thing as a helium atom stripped of its electrons. This obviously changes the number of protons in the nucleus of the isotope and may result in its stabilization. The other means of forming a new element is by nuclear fusion, in which two atomic nuclei fuse or bond. Note that the first of these means by which elements are formed is subtractive; in other words, with radioactive decay, a different element is formed by the expulsion of protons. Nuclear fusion, on the other hand, is additive, resulting in the creation of different elements by the addition of protons to an atomic nucleus. Radioactive decay takes place inside Earth (among other places), while nuclear fusion is the source of the Sun's power. Nuclear fusion involves the release of huge amounts of energy. On Earth, scientists have been able to bring about uncontrolled nuclear fusion in the form of the so-called hydrogen bomb, which is actually a "fusion bomb." They have yet to succeed in creating controlled nuclear fusion. If and when they do, it would provide a safe, clean source of almost limitless power and probably would constitute the greatest scientific or technological discovery since fire. On the Sun, nuclear fusion has been taking place, and will continue to do so, for a long, long time. The 92 naturally occurring elements of the universe are the result of fusion reactions, meaning that all that we see around us was once part of a star. This represents a major break with the ancient belief that Earth is made of fundamentally different substances than are the bodies of space (see Earth, Science, and Nonscience). In fact, our world and everything in it—including our own bodies—is truly "the stuff of stars." In comparison to the Sun, the Moon is altogether less remarkable. Below, we review some statistics about the sizes of each, but as every elementary-school student today knows, the Sun is much, much larger and exerts far more impact on the fate of the solar system—including Earth. The Moon does not even have its own energy sources: its light comes from the Sun, and the absence of an atmosphere, of volcanic activity, or even of a significant magnetic field makes it a very dull place indeed. Yet the Moon has inspired at least as much fascination among humans over the ages as has the Sun. There is its physical beauty, though comparisons with the Sun are hardly fair, since we cannot look at the Sun without damage to our eyes. There is also its influence on earthly cycles ranging from the tides to the months themselves, though some claims of lunar influence have little basis in fact. During the Middle Ages, many believed that the Moon caused madness, a superstition still reflected in our word lunacy. Still, humans have long associated a spirit of mystery with the Moon, in part because of its ever-changing appearance and in part because it has always showed just one side to Earth. (We discuss the reason why later.) Only in 1959, when the Soviet space probe Luna traveled to the "dark side of the Moon," did scientists gain a glimpse of it. Unmanned and later manned journeys, which culminated with the U.S. Moon landing in 1969, also changed astronomers' understanding of the Moon's origins. 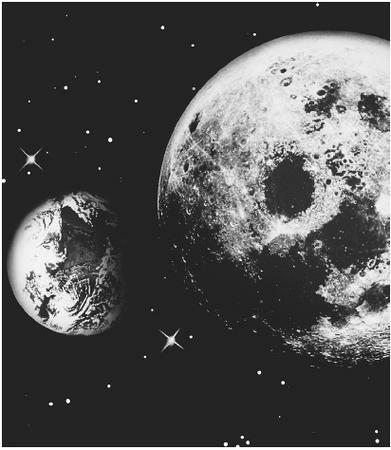 One of the curious things about the Moon is its size in relation to Earth. Nowhere in the universe is there such a small size differential between a satellite and the planet around which it orbits, the only possible exception being Pluto and its moon, Charon. Because our Moon is so close in size to Earth, scientists once speculated that they might have shared origins, and this speculation informed several theories concerning the formation of the Moon. According to the fission theory, the Moon was a piece of Earth that had been torn away, perhaps from the Pacific basin. The simultaneous creation theory likewise depicted Earth and the Moon as sharing origins, but in this case they literally had been formed together from the same materials. Finally, there was the capture theory, which, in contrast to the others, assumed quite different origins for the two bodies: the Moon had formed somewhere else in the solar system and had been captured by Earth's gravitational field after it wandered too close to the planet. As it turned out, the capture theory was closest to the theory accepted today, though it was discarded along with the other two on the basis of data brought back from the Apollo Moon landings. According to the giant impact theory, sometimes called the Big Whack model or the ring ejection theory, at a young age Earth was sideswiped by a celestial object as large or larger than Mars. As a result of that collision, a ring of crustal matter was spewed into space, and over time the matter in this ring agglomerated to form the Moon. The Moon is about 240,000 mi. (385,000 km) from Earth, meaning that it takes about 1.25 seconds for its light to reach Earth. By contrast, the Sun's distance from Earth is so great that it takes eight minutes for sunlight to reach our planet, even though light travels through space at the speed of about 186,000 mi. (299,339 km) per second. The distance between Earth and the Sun is the basis for the astronomical unit (AU), a figure used for measuring the distance between bodies in the solar system. Equal to the average distance from Earth's center to the center of the Sun, an AU is designated 1.49597870691 × 108 km, or approximately 92,955,807 mi. Usually we think of the solar system as the area encompassed by the orbit of the most remote planet, Pluto, but that is only 39.44 AU, a tiny figure compared with the diameter of the realm within the Sun's gravitational pull, which is a staggering 100,000 AU. The Sun itself has a diameter of about 856,000 mi. (1,392,000 km), meaning that the distance across it is about 109 times that of Earth's diameter. Another way to consider that figure is this: if one were to draw a circle as big as the Sun around Earth, the edge of that circle would be about twice as far away as the Moon. The Sun's volume is so great that about 1.3 million Earths could fit inside it, and its mass is about 300,000 times that of Earth. In fact, it accounts for about 99.8% of the mass of the entire solar system. By contrast, the Moon has a diameter of only about 2,160 mi. (3,475 km), a little less than the distance from New York to Los Angeles. Its mass is a little more than 1% of Earth's, and as a result, its gravitational pull is too small to retain the gases that make up the atmosphere. That small mass, combined with an imbalance in its distribution, explains why the Moon shows only one face to Earth. The side of the Moon facing Earth is of greater mass than the other side and is therefore more strongly attracted by Earth's gravitational force. The result is a phenomenon called gravitational locking, whereby the Moon rotates on its axis at exactly the same rate as it travels around Earth—once ever 29.5 days. Clearly, the Moon is tiny in both volume and mass, and were it as far away as the Sun, we would hardly pay it notice. Yet it should be pointed that even the Sun itself, while remarkable in our own solar system, is far from a standout in the universe as a whole. It is a youngish star, of average size, and not all that different from billions of other stars throughout the cosmos. It is not even unique in being the only star with its own solar system. In 1999 astronomers discovered an entire solar system some 44 light-years from Earth, in which three large planets were found to be circling the star Upsilon Andromedae. temperature and the composition of each body. With regard to the Moon's temperature, little need be said, since it is entirely a function of the Moon's exposure (or lack of exposure) to heat from the Sun. On the Moon figures range from 280°F (138°C) to −148°F (−100°C), with a mean temperature of −10°F (−23.33°C). As for the Moon's composition, it has similarities to and differences from that of Earth, and both these similarities and differences are instructive. The internal composition of the Moon is such that it often is treated along with the terrestrial planets. In addition, it is not much smaller than the smallest terrestrial planet, Mercury. But whereas Mercury has a proportionally large, extremely hot core, the Moon's core is much smaller in proportion to its total size and much cooler. In all likelihood it is not even molten, or only a portion of it is. It appears that the Moon has an internal structure not dissimilar to that of Earth—that is, a crust, mantle, and core. The materials that make up the Moon, however, are quite different. Aluminum, calcium, iron, magnesium, titanium, potassium, and phosphorus have been found on the Moon, but it seems bereft of organic compounds, indicating that life never existed there. Moon rocks are primarily of basalt, or hardened lava, and breccia, soil, and rock fragments that have melted together. The formation of these rocks must have occurred a long, long time ago, because the Moon has not had volcanic activity for several billion years. Thus, it is almost entirely "dead," lacking even a magnetic field of any significance. Moon rocks have only the faintest magnetic field, suggesting the absence of a significant molten core, which is what gives Earth its own magnetism. From the traces of magnetism found in these rocks, it is possible that the Moon had a magnetic field of some significance at one time, but that time is long past. Owing to the Moon's lack of sufficient gravitational force, it retains no atmosphere, and this means that it is completely vulnerable to particles reaching it from space. Early in its life, the Moon was subjected to a 700-million-year-long meteor shower that formed its craters. 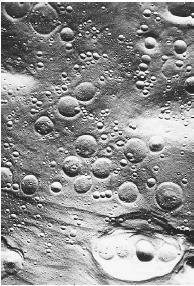 The damage from these showers was so great that it melted the Moon's crust, and eventually lava from the lunar interior surfaced to fill in cracks made by the meteorites. In 1609 the Italian astronomer Galileo Galilei (1564-1642), the first scientist to gaze at the Moon through a telescope, observed dark patches that looked to him like bodies of water. He named these patches seas, a term that has remained in use among lunar cartographers, though Galileo's "seas" long ago were identified as dark spots made by cooling lava in the cracked surface. As it is vulnerable to particles from space, the Moon also is susceptible to dramatic temperature changes brought about by the presence or absence of sunlight. For this reason, parts of the lunar surface are extremely hot at certain times, while other portions have never been penetrated by sunlight and are almost inconceivably cold. One such cold spot is at the Moon's south pole, in a basin carved out by an asteroid. There, temperatures are as low as −387°F (−233°C), within 40°C of absolute zero, or the temperature at which all molecular motion virtually ceases. By contrast, Pluto, which is so far from the Sun that the great star appears merely as a bright dot from there, has an average surface temperature that is warmer by 8°C. Yet in this inhospitable spot on the lunar surface, the U.S. probe Lunar Prospector in 1998 found something quite surprising: water. Mixed in with dirt in the South Pole-Aitken Basin are ice crystals, which scientists speculate make up about 10% of the material in the surrounding area. Apparently moisture residue from comets that struck the Moon over the past three billion years, the ice offers intriguing possibilities. If a cost-effective method for extracting ice from the soil can be developed, colonization and exploration of the Moon may become a reality. For now, however, human presence on the Moon is more a thing of the past than of the future. The first man-made spacecraft to visit the Moon was the Soviet Luna 2 in 1959, and seven years later, Luna 9 became the first such craft to land on the lunar surface. Its landing dispelled long-held fears that the Moon was awash in thick layers of dust; in fact, the lunar surface is a grayish soil, primarily composed of rock fragments, from 5 ft. to 20 ft. (1.5 m to 6 m) deep. Though the Soviets were the first to reach the Moon in unmanned craft, the United States was the first (and so far the only) nation to put a man on the Moon. On July 20, 1969, in one of the most dramatic events of human history, the U.S. astronauts Neil Armstrong (1930-) and Edwin ("Buzz") Aldrin (1930-) walked on the lunar surface while Michael Collins (1930-) piloted Apollo 11 in its orbit around the Moon. Photographs from the Moon landing show the American flag extended, as though waving in a breeze as it would on Earth, but it actually was held in place mechanically, since there is no wind on the Moon. Aldrin and Armstrong demonstrated one of the most dramatic differences between the Moon and Earth: a decrease in weight. A man who weighs 200 lb. (90.72 kg) on Earth would weigh 33.04 lb. on the Moon and would therefore be much easier to lift. But he would be no easier to push from side to side, because his mass would not have changed. Weight is the product of mass multiplied by the rate of gravitational acceleration and is therefore dependent on the gravitational force of the celestial body on which it is measured. Mass, on the other hand, does not vary anywhere in the universe. Thus, although 33.04 lb. is equal to 14.99 kg on Earth, the hypothetical astronaut described here would still have a mass of 90.72 kg. Physicists had long known these facts about weight and mass, but footage of Armstrong and Aldrin bouncing around on the lunar surface provided a much more vivid demonstration. As it turned out, however, their foray to the Moon was the beginning of an all-too-brief chapter. Over the next three years, the United States conducted five more lunar landings as well as the failed 1970 mission designated Apollo 13 (portrayed in the 1995 movie of that name), which never landed due to an onboard explosion. The last Moon mission took place in 1972, and soon afterward America was thrown into a recession spawned by the 1973 oil crisis. The next sustained effort at space flight, which began with the launch of the space shuttle in 1981, had an entirely different mission and destination—one that lay well within Earth's gravitational field. Needless to say, there never will be any space missions, manned or otherwise, to the Sun. Spacecraft have passed close to Mercury, but as for the Sun, even its corona, or outermost atmospheric layer, has a temperature of 2,000,000 on the Kelvin scale of absolute temperature, or 3,599,541°F. The Sun could not be more different from the Moon, most notably in terms of energy and temperature. It should be noted, however, that the Sun's temperature does not increase uniformly from the corona to the core. The "coolest part," at 5,800K (9,981°F), is the photosphere, a layer some 300 mi. (480 km) thick that constitutes the visible surface of the Sun. Above it, temperatures rise through the chromosphere, which is about 1,600 mi. (2,560 km) thick, becoming hotter still in the corona. Scientists do not understand the reasons for this temperature rise at the outer surface of the Sun. Less surprising is the continued increase of temperature beneath the photosphere. The deeper inside the Sun, the higher the temperatures, until it reaches a staggering 15,000,000K (27,000,000°F) at the core. It is so hot there that not even atoms can exist; instead, the Sun's core is made up of subatomic particles—specifically, protons and electrons. Heat and movement are directly related in physics, and these particles are moving very fast—so fast that nuclear fusion can and does occur when these particles smash together. NUCLEAR FUSION IN THE SOLAR CORE. When four protons fuse and absorb two electrons, amazing things happen. The result is the creation of a helium nucleus, whose mass is slightly smaller than the combined mass of the separate particles. Where did that "missing" mass go? It was converted to energy—an amount of energy that is staggering when multiplied by the large numbers of hydrogen atoms being converted to helium at any given moment. That, in essence, is how the Sun creates energy—by converting hydrogen to helium. This energy is radiating from the Sun in electromagnetic waves at an amazing rate every second, and eventually it will be used up. Long before that happens, however, the Sun will begin to expand and cool. "Cooling," of course, is a relative term; this expanding Sun, a red giant, will burn up Earth even as it absorbs Mercury entirely. Then, when it has used up all its hydrogen, nothing will remain but a glowing core called a white dwarf. There is no need to worry, however, because the events described will not happen anytime soon. The Sun has about as much life left in it as the amount of time it has lasted so far—approximately five billion years, or longer than Earth has existed. Given the fact that about 4.96 million tons (4.5 × 106 metric tons) of hydrogen are converted to helium every second, this gives some idea of the vast energy reserves on the Sun. THE SUN'S ENERGY AND EARTH. Sunlight is more than just light, though that alone is a marvelous thing. The rays projected by the Sun are electromagnetic energy, of which visible light is only a small part. Also contained in the electromagnetic spectrum are long waves, short waves, and microwaves (including those used for transmitting radio and television signals); infrared and ultraviolet light; and x rays and gamma rays. Solar energy travels to Earth by means of radiation, a form of heat transfer that, unlike conduction or convection, requires no physical medium such as air. It can move through the vacuum of space to Earth's atmosphere, where a portion of it is absorbed and becomes the fuel that powers spaceship Earth. It is a measure of the Sun's vast energy that Earth receives only 0.00000005% of its total output at any given moment. Of that small fraction (equal to one part in two billion), a much smaller portion makes it through Earth's atmosphere—yet that is enough to light the world and to facilitate the myriad other functions, such as photosynthesis, for which we depend on the Sun. Many effects of the Sun's light and energy are less than desirable, of course: sunburns and sometimes even tans, bleaching of materials exposed to light for too long, temporary blindness caused by gazing at the Sun or even at something reflecting it, and so on. These effects, too, attest to the Sun's awesome power. The Sun makes possible the operations of three of four Earth systems and indirectly affects the fourth (see Earth Systems). The hydrosphere and atmosphere are both affected, for instance, by the evaporation of water for eventual precipitation, a process powered by the Sun. Likewise, the biosphere could not exist without photosynthesis and the other biological processes dependent on sunlight. Even the geosphere, though not directly powered by the Sun, is influenced by Sun-powered phenomena from the other three spheres. Even traveling at the speed of light, a photon takes nearly 30,000 years to travel from the center of the Sun to the corona. If it were in a vacuum, it could make the journey in about four seconds, but it continually bumps into other particles, and this slows it down (to put it mildly). Once it finally escapes the solar surface, it travels rather quickly, transmitting the Sun's light to the solar system. When that light reaches Earth's atmosphere, it creates a number of strange optical effects. One of the best known is the rainbow, produced by the refraction, or bending, of light inside a raindrop. Because the colors of the visible spectrum are bent at different angles, they disperse as though in a prism; after being refracted a second time by the surrounding air, the billions of raindrops that fill the atmosphere after a storm produce a brilliant band of light. these wavelenths combine, they appear bluish. The combination of light and differing temperatures on the ground produces a mirage, while icecrystals in the air may bring about haloes around the Sun or Moon and, in some cases, a sun dog, a reflected image of the Sun. One of the most breathtaking displays of atmospheric optical phenomena are auroras (or aurorae), natural fireworks that appear in the night sky. Visible in the northern United States and Canada, the auroras there are known as aurora borealis, or northern lights. A similar phenomenon occurs in the Southern Hemisphere, where it is called the southern lights, or aurora australis. 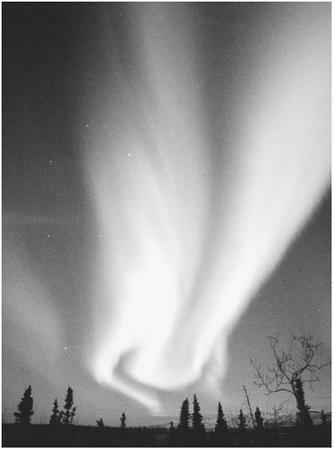 The source of the auroras is a stream of particles, called the solar wind, that emanates from the Sun. The solar wind is a consequence of the extreme heat on the Sun's surface, which causes atoms there to move so rapidly that even the enormous gravitational force of the Sun itself cannot hold them. Solar particles pass through the entire solar system and out to space beyond, but few of them reach Earth's atmosphere, because they are deflected by the planet's magnetic field. The particles that cause auroras are electrons that instead of being deflected, are drawn toward Earth's polar regions. Two great rings of charged particles, called the Van Allen belts, are located high above each polar region, and they catch the majority of charged particles flowing toward them from the northern and southern hemispheres, respectively. The Van Allen belts cannot trap all the charged particles, however, and some enter the atmosphere, where they collide with oxygen and nitrogen molecules at about 50 mi. to 600 mi. (80 km to 1,000 km) above sea level. Some of these molecules become electrically charged and take on a colored glow. At higher levels oxygen glows red, while oxygen at lower levels is yellowish-green. Nitrogen glows blue. SUNSPOTS AND THE SOLAR ACTIVITY CYCLE. Though auroras are visually remarkable, a more significant solar phenomenon is the sunspot. Sunspots are cooler regions—many of them vast in size—on the photosphere. They tend to be about 2,700°F (1,500°C) cooler than the surrounding areas, and for this reason they appear darker. Sunspots seem to occur in 11-year cycles—a period known as a solar activity cycle—and are the result of strong magnetic fields. The latter, in turn, result from something called differential rotation: the Sun's equator rotates once every 26 days, whereas its poles rotate every 36 days, resulting in massive twisting of magnetic fields. This can produce anomalies such as sunspots, which disrupt radio communications on Earth. Other solar anomalies, such as prominences, or hot spots formed by magnetic loops in the Sun's atmosphere, also follow the 11-year solar activity cycle. Actually, the cycle as it is known and measured today is about 11 years long. Its length seems to have varied over time, producing past changes in global temperature: the shorter the cycle, the warmer the temperatures on Earth. As noted earlier, the Sun and Moon have long inspired awe in humans, and in this the Moon has been a more than equal partner. Prehistoric and ancient humans regarded both lunar eclipses, in which Earth's shadow covers the Moon, and solar eclipses, in which the Moon comes between Earth and the Sun, as portents from the gods. From at least the era of the Babylonians onward, the Sun and Moon played complementary roles in marking time. The marking of time according to the Sun relies on an objective reality, rather than a mere human construct. The year, which involves a complete cycle of seasons, is based on the amount of time Earth takes to revolve around the Sun. During this time, the planet also moves on its axis, causing the changes in orientation that bring about the seasons. Likewise a day is an objective reality, being the amount of time it takes Earth to revolve on its axis. The month and week, on the other hand, relate to the phases of the Moon, which are themselves dependent on the Moon's position relative to Earth and the Sun. A lunar cycle lasts about 29.5 days, and this became the basis for the month, which lasts from 28 to 31 days. Within that lunar cycle are four phases—new, first quarter, full, and last quarter—which eventually became the basis for the idea that a month has about four seven-day weeks. Until about 1500, people thought of the Sun and Moon as two of the seven "planets" (including the five planets visible with the naked eye) that supposedly revolved around Earth. They further related these "planets" to the days of the week. As a result, virtually every culture that speaks a European language—not only in Europe itself butalso among former European colonies in the Americas, Africa, Asia, and the Pacific—refers to the first day of the week as the Sun's day and the second as the Moon's day. Today, in countries that speak Romance languages, or languages derived from Latin (most notably Italian, French, Spanish, and Portuguese), variations on the original Latin namesremain in use: Domingo and Lunes in Spanish, for instance, or Dimanche and Lundi in French. Germanic languages adopted the ideas of the Latin day names, for the most part, but translated them into their own tongues: hence, Sonntag and Montag in German, or Sunday and Mondayin English. One reason the ancients respected the Moon as much as the Sun is that it seemed to affect many aspects of human life—as indeed it does. Medieval ideasabout "lunacy" were themselves more than a little off-kilter, and the belief that the Moon affectsfemale menstrual cycles has come under significant challenge. Nevertheless, the Moon doesseem to have some effect on human biologicalcycles. The human circadian rhythm, or cycle ofsleep and wakefulness, stretches over a period of 25 hours, meaning that a person living in a cave without any exposure to sunlight would eventually assume a 25-hour-a-day schedule. The reason for this disparity between the human circadian cycle and the length of a solar day is not known, but it is possible that the circadian cycle is based on the length of a lunar day, or the interval between periods of time when the Moon appears in the sky over a given spot on Earth. Because the Moon is moving even as Earth is rotating, this span of time is not 24 hours, the interval it takes Earth to rotate on its axis, but 24 hours and 50 minutes. It is also more than an old wives' tale that people behave strangely around the time of a full moon: in fact, more deaths and accidents do occur at that point in the monthly cycle. One of the most significant lunar-influenced cycles, however, is not monthly but semidiurnal, or twice daily. These are the cycles of Earth's tides, brought about by the gravitational attraction exerted on Earth by the nearest significant celestial object. (The Sun also affects tides, but much less so because of its greater distance from Earth.) Though the Moon's effect on tides has been known since ancient times, the ancients did not understand the gravitational nature of its attraction, which actually causes a bulge to appear in the oceans. In fact, two bulges appear, one in the oceans on the side of Earth nearest the Moon and one on the opposite side. The latter is also a result of the Moon's gravitation, which pulls Earth in the other direction, thus drawing the solid earth away from the water. These bulges are known as high tide, and the resulting displacement of water causes a low tide. In most places on Earth, tides are semidiurnal, meaning that there are two full cycles of high and low tide per day. Sometimes these variations can be very great, as at the Bay of Fundy in Canada, where the tidal range is as large as 46 ft. (14 m). The tides are related closely to phases of the Moon, or, to put it another way, they are affected by the alignment between the Moon and the Sun. At the new moon, the Moon is between Earth and the Sun, and during a full moon, the Moon is on the other side of Earth from the Sun. (Because of a 20° angle between Earth's orbit and that of the Moon, Earth rarely casts a shadow on a full moon, except in the case of a lunar eclipse.) In the new-moon and full-moon phases, the Moon and Sun are aligned, and this combination of lunar and solar gravitation produces strong spring tides every 14 days. On the other hand, when the Moon and Sun are at angles to each other—during the first quarter and last quarter, sometimes known as half-moons—it produces a much weaker neap tide. Beatty, J. Kelly, Carolyn Collins Petersen, and Andrew Chaikin. The New Solar System. 4th ed. New York: Sky Publishing, 1999. Earth and Moon Viewer (Web site). <http://www.fourmilab.ch/earthview/vplanet.html>. Lewis, John S. Physics and Chemistry of the Solar System. San Diego: Academic Press, 1997. Lodders, Katharina, and Bruce Fegley. The Planetary Scientist's Companion. New York: Oxford University Press, 1998. The Moon (Web site). <http://seds.lpl.arizona.edu/nineplanets/nineplanets/luna.html>. Moore, Patrick. The Data Book of Astronomy. Philadelphia: Institute of Physics, 2000. Pérez, Miguel. The Earth and the Universe: How the Sun, Moon, and Stars Cause Changes on Earth. Illus. María Rius. Happage, NY: Barron's Educational Series, 1998. Skinner, Brian J., Stephen C. Porter, and Daniel B. Botkin. The Blue Planet: An Introduction to Earth System Science. 2d ed. New York: John Wiley and Sons, 1999. The Solar and Heliospheric Observatory (Web site). <http://sohowww.nascom.nasa.gov/>. The Sun (Web site). <http://www.solarviews.com/eng/sun.htm>. The Sun (Web site). <http://www.seds.org/nineplanets/nineplanets/sol.html>. The temperature at which all molecular motion virtually ceases. A figure equal to the average distance from Earth's center to the center of the Sun. TheSI figure for an AU, adopted in 1996, is equal to 1.49597870691 × 108 km, or approximately 92,955,807 mi. In general, an atmosphere is a blanket of gases surrounding a planet. Unless otherwise identified, however, the term refers to the atmosphere of Earth, which consists of nitrogen (78%), oxygen (21%), argon (0.93%), and other substances that include water vapor, carbon dioxide, ozone, and noble gases such as neon, which together comprise 0.07%. The smallest particle of an element, consisting of protons, neutrons, and electrons. An atom can exist either alone or in combination with other atoms in a molecule. An SI unit (abbreviated amu), equal to 1.66 × 10−24 g, for measuring the mass of atoms. The number of protons in the nucleus of an atom. Since this number is different for each element, elements are listed on the periodic table in order of atomic number. A figure used by chemists to specify the mass—in atomic mass units—of the average atom in a large sample. A combination of all living things on Earth—plants, mammals, birds, reptiles, amphibians, aquatic life, insects, viruses, single-cell organisms, and so on—as well as all formerly living things that have not yet decomposed. Typically, after decomposing, a formerly living organism becomes part of the geosphere. The center of Earth, which appears to be of molten iron. For terrestrial planets in general, core refers to the center, which in most cases is probably molten metal of some kind. The study of the origin, structure, and evolution of the universe. A form of energy with electric and magnetic components, which travels in waves. The complete range of electromagnetic waves on a continuous distribution from a very low range of frequencies and energylevels, with a correspondingly long wavelength, to a very high range of frequencies and energy levels, with a correspondingly short wavelength. Included on the electromagnetic spectrum are long-wave and short-wave radio; microwaves; infrared, visible, and ultraviolet light; x rays, and gamma rays. A negatively charged particle in an atom, which spins around the nucleus. The tendency of an object in motion to remain in motion and of an object at rest to remain at rest. An atom that has lost or gained one or more electrons and thus has a net electric charge. Atoms that have an equal number of protons, and hence are of the same element, but differ in their number of neutrons. This results in a difference ofmass. An isotope may be either stable or radioactive. The planets between Mars (the last terrestrial planet) and Pluto, all of which are large, low indensity, and composed primarily of gases. Established by William Thomson, Baron Kelvin (1824-1907), the Kelvin scale measures temperature in relation to absolute zero, or 0K. (Note that units in the Kelvin system, known as Kelvins, do not include the word or symbol for "degree.") The Kelvin scale, which is the system usually favored by scientists, is directly related to the Celsius scale; hence Celsius temperatures can be converted to Kelvin by adding 273.15. A unit of distance used by astronomers for measuring the extremely large expanses of space. Equal to the distance light travels in a year, a light-year is 9.460528405 × 1012 km, or approximately 5.88 trillion mi. The upper layer of Earth's interior, including the crust and the brittle portion at the top of the mantle. The layer, approximately 1,429 mi. (2,300 km) thick, between Earth's crust and its core. In reference to the other terrestrial planets, mantle simply means the area of dense rock between the crust and core. A subatomic particle that has no electric charge. Neutrons are found at the nucleus of an atom, alongside protons. A nuclear reaction that involves the joining of atomicnuclei. The center of an atom, a region where protons and neutrons are located and around which electrons spin. At one time, chemists used the term "organic" only in reference to living things. Now the word is applied to most compounds containing carbon, with the exception of calcium carbonate (lime-stone) and oxides, such as carbon dioxide. A chart that shows the elements arranged in order of atomic number, along with chemical symbol and the average atomic mass for that particular element. A particle of electromagnetic radiation carrying a specific amount of energy. The branch of the earth sciences, sometimes known as planetology or planetary studies, that focuses on the study of other planetary bodies. This discipline, or set of disciplines, is concerned with the geologic, geophysical, and geochemical properties of other planets but also draws on aspects of astronomy, such as cosmology. A positively charged particle in an atom. The transfer of energy by means of electromagnetic waves, which require no physical medium (for example, water or air) for the transfer. Earth receives the Sun's energy, via the electromagnetic spectrum, by means of radiation. A term describing a phenomenon whereby certain materials are subject to a form of decay brought about by the emission of high-energy particles or radiation. Forms of particles or energy include alpha particles (positively charged helium nuclei); beta particles (either electrons or sub atomic particles called positrons); or gamma rays, which occupy the highest energy level in the electromagnetic spectrum. The bending of light as it passes at an angle from one transparent material into a second transparent material. Refraction accounts for the fact that objects under water appear to have a different size and location than they have in air. An abbreviation of the French term Système International d'Unités, or "International System of Units." Based on the metric system, SI is the system of measurement units in use by scientists worldwide. The four inner planets of the solar system: Mercury, Venus, Earth, and Mars. They are all small, rocky, dense, have relatively small amounts of gaseous elements, and are composed primarily of metals and silicates. Compare with Jovian planets.